The New York Times reported last week that President Obama decided not to apologize to Pakistan about the U.S. airstrikes that killed Pakistani soldiers near the Afghan border in part because he did not want to be seen to be overruling his military commanders yet again. How ironic that the president should feel the need to accept the advice of his military leaders on diplomatic matters while regularly disregarding their opinions on military matters. This most recent incident illuminates the ongoing confusion in the White House and among the American political elite generally about how the president should take advice from his senior military commanders. The situation has become very dangerous for an administration that has overruled its commanders dramatically and frequently and is reportedly considering doing so again by announcing accelerations of the withdrawal of American forces from Afghanistan beyond what military commanders have recommended. Such confusion is not confined to the White House. In a recent Republican presidential debate, candidates sparred over the proper role of the president as commander in chief. Mitt Romney emphasized the importance of listening to commanders in the field. Jon Huntsman dismissed that idea with reference to the bad advice tendered by commanders in 1967 during the Vietnam war, declaring that the president is commander in chief and must therefore make his own decisions. Understanding the proper relationship between the president and his generals is essential both for the president and for Americans concerned about national security. The president has the right to make decisions about the conduct of war as he sees fit, but he jeopardizes America and brings his own fitness for office into question by dismissing the professional advice of commanders he has personally selected. The commanders of American troops in combat are the president's. He is responsible for choosing them and, by doing so, reposes his confidence in their abilities, judgment, and integrity. If and when he loses confidence in a commander, he has not only the right but the obligation to replace that commander. The same is true of the other military and civilian leaders of the armed forces. The president is personally responsible for selecting the chairman of the Joint Chiefs of Staff, the other service chiefs if he so desires, the secretary of defense, and all of the combatant commanders. The services can and do propose various names for these positions. But the final selections are the president's alone. The Vietnam war not only poisoned American politics, but also enshrined a fundamental misunderstanding of civil-military relations. The American military is not an adversary to the White House, a rival to the president, or a challenger to any other governmental organization. More than any other government body, the military is explicitly an instrument wielded by the president. His personal involvement in the selection of military officers at various levels, which is so much greater than his involvement in the selection of subordinates at any other cabinet office, demonstrates the degree to which those officers are executors of the president's orders. Commanders are all imperfect, of course. Some may mistakenly put interests other than those of accomplishing the orders they've been given ahead of their duty. 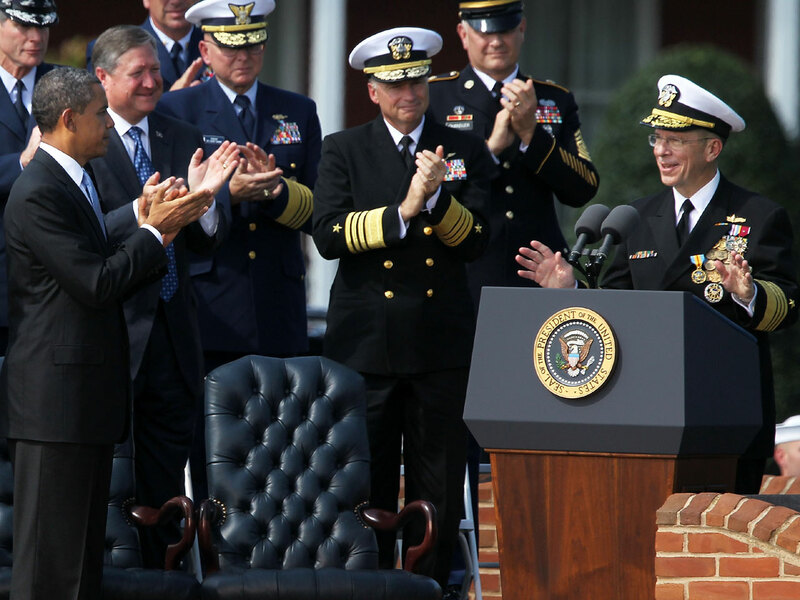 More often, commanders may offer advice or make decisions or judgments with which the president disagrees. And the president, in those cases, has the right to overrule his commanders. But, if a president finds himself repeatedly overruling or rejecting the advice of commanders he himself has selected, his own judgment must start to come into question. Is he such a bad judge of character and capability that he cannot see the quality of officers he selects for command before he selects them? Is he so weak a leader that he allows choices for senior military positions to be made by default? Or is something else at work entirely? If the president, as commander in chief, rejects the advice of his field commanders and senior staff and chooses another course of action for military operations, on the basis of what planning and judgment does he do so? Ambassador Huntsman's comments about the forces he believes would be adequate to accomplish a vaguely defined mission in Afghanistan highlighted precisely this problem. Airily explaining that 10-15,000 troops would be more than enough to conduct counterterrorism operations, Huntsman demonstrated his own ignorance of the intricacies of military operations. How did he arrive at that number? Did he or someone on his staff identify the locations from which drones and Special Forces strike groups would operate? The tasks required to protect those locations from insurgent attack? The requirements for helicopters, aircraft, and trucks to supply them? The maintenance teams needed to keep that equipment running? Of course not. Choosing a number that seems "right" to a career politician is almost certain to lead to the wrong number. Providing precision about the requirements to accomplish specific military tasks is the job of military staffs, which is why overruling the recommendations of those staffs, tendered by their commanders, is such a dangerous course. Yet this is the course President Obama has repeatedly pursued. In December 2009, he endorsed General Stanley McChrystal's assessment of the situation in Afghanistan as well as the strategy McChrystal proposed to achieve it, but then withheld a quarter of the combat forces McChrystal had identified as necessary to accomplish the president's objectives. In June 2011, President Obama reportedly received recommendations from General David Petraeus to cut not more than 5,000 troops from Afghanistan in this year and to retain the force levels in that theater at roughly constant levels through the end of 2012. Obama rejected that advice, ordering the withdrawal of 10,000 troops by the end of 2011 and another 23,000 by September 2012. Meanwhile, painstaking staff work in Iraq led General Lloyd Austin to recommend trying to keep more than 20,000 troops in Iraq after the end of 2011. The White House also rejected that advice and was negotiating with the Iraqi government to keep around 3,000 troops in Iraq. Encountering challenges in that negotiation, the White House then dropped the matter entirely and decided instead to withdraw all U.S. troops from Iraq by the end of this year, despite the fact that no military commander supported the notion that such a course of action could secure U.S. interests or the president's stated objectives. Three different commanders in two theaters, all personally selected by President Obama, offered their best professional military advice about how to achieve the president's stated goals. In each case, the Joint Chiefs of Staff supported those recommendations. In Afghanistan, at least, two secretaries of defense did as well. In none of these cases had another military staff developed a different recommendation. Nor was there any significant difference of opinion reported within the senior military ranks about the field commanders' recommendations. Yet President Obama selected his own troop numbers and his own timelines in every instance. Again, President Obama had the right to make every one of those decisions, and the dedication of the American military to the principle of civilian authority has been highlighted by the fact that every commander the president overruled saluted and moved to execute his new orders. There is a wide gap between having the right to do something and having the wisdom to do the right thing, however. Are we really comfortable saying that three different four-star generals--David Petraeus, Lloyd Austin, and Stanley McChrystal--were so incompetent either at understanding the president's objectives or at developing military courses of action to achieve them that the president had to overrule them? Under no circumstances should the president of the United States ever take an important military decision simply because a uniformed officer has recommended it. But, when the president does overrule his commanders, he had better have an extremely good reason not only to reject their advice but to prefer his own wisdom. And if he finds himself doing it repeatedly, he would do well to consider what the source of the problem really is. Frederick Kagan is a resident scholar at the American Enterprise Institute and a regular contributor to the Weekly Standard. The opinions in this commentary are solely those of the author.